Let us help ensure your home is a Healthy Home. The purpose of a Post Remediation Verification Inspection (PRVI) or Mold Clearance Test is to assure that the mold cleanup has been done correctly and effectively in the work area and to confirm that the cleanup did not accidentally distribute high levels of moldy dust and debris into other building areas or into its mechanical systems such as heating or air conditioning systems. To avoid conflicts of interest, Post Remediation Verification Inspection (PRVI) or Mold Clearance Test should never be performed by the mold remediation contractor. We will provide a visual inspection of both the cleaned area and any adjoining building areas. In the clean-up area we will ensure that the demolition has been sufficient so that no moldy materials remain, and that all surfaces appear to have been physically cleaned. If a fungicidal sealant was to be applied, we will inspect to ensure that it was not simply sprayed over the mold or dirt and debris instead of first cleaning the surfaces correctly according to the ANSI Aproved IICRC S-520. Call IAQ Solutions Today for a Free IAQ Telephone Consultation. (407) 383-9459 We'll Make sure Your home is a "Healthy Home". In order to successfully complete remediation project, it is important to have clear goals in place from the very beginning. IAQ Solutions Mold Inspectors are ALL Individually Licensed by the State of Florida. IAQ Solutions standards for clearance are more strict than most mold assessors we work with. But we are always comfortable knowing that we are leaving our clients with a properly restored environment when IAQ Solutions does the Post Remediation Verification Inspection & Clearance Testing. I refer all my clients to IAQ Solutios for their Post Remediation Verification Inspection & Clearance Testing. The presence of indoor mold growth and/or spores, whose identity, location and amplification are not reflective of a normal fungal ecology for an indoor environment, and which may produce adverse health effects and cause damage to materials, and adversely affect the operation or function of building systems. The S-520 defines Normal Fungal Ecology as; That which is reflective of the types and concentrations of molds typically found in non-water damaged, environmentally well-maintained structures, and reflective of the ecological and climatic elements of the geographical region in which the building is located. 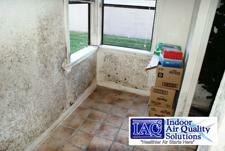 Call IAQ Solutions Today and Start Improving Your Indoor Air Quality. There are some remediators who may have complicated the evaluation process by suggesting that they need to perform additional services or testing beyond that stated in IICRC S520. All Post Remediation Verification Inspection (PRVI) or Mold Clearance Test should be conducted by an IEP (Indoor Environmental Professional). As simplistic as it may sound, using a white towel to wipe a surface to see if it is clean is extremely helpful. In the industry, this process is known as the “white glove” test. To make it even more effective, IEP’s can alternate the white towel with a black towel. Some dusts won’t show on a white towel because the dust is white. This may seem to be extremely low tech, and it is, but it works. Dust serves as a surrogate for mold spores and fragments. If you remove the dust, you remove the mold. If remediators strictly follow this approach to quality control, then the Post Remediation Verification Inspection (PRVI) or Mold Clearance Test will almost always indicate that the remediation was successful. The Post Remediation Verification Inspection (PRVI) or Mold Clearance Test then establishes that the structure, contents or systems have been returned to a normal fungal ecology or an S-520 Condition 1.